Last week my new (huge!) UGA art installation went up. Meet Passages II! 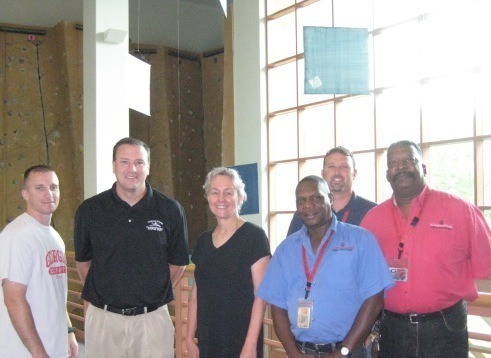 The mobile was installed in honor of Dr. Jane Russell, the woman who envisioned and created the Ramsey Student Center for Physical Activities, the place we can visit to discover our personal best. We celebrate Dr. Russell’s service to the University upon her retirement, and wish her well in all her endeavors. I love creating site-specific work. 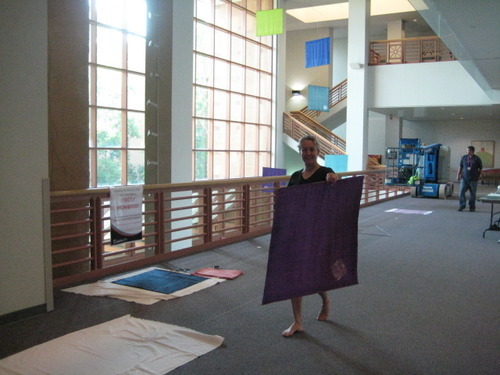 As I studied this location (at the Ramsey Student Center for Physical Activities on the University of Georgia campus), I thought very carefully about how my design would affect and be affected by its setting. As you may have read before, I love squares, so I was pleased that my work would be situated in front of a wall of square windows. 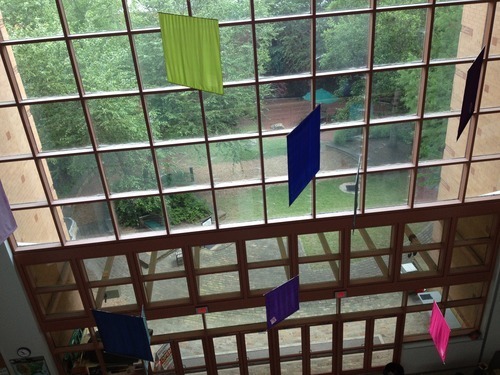 The windows correspond so nicely with the colorful silk squares in my installation! 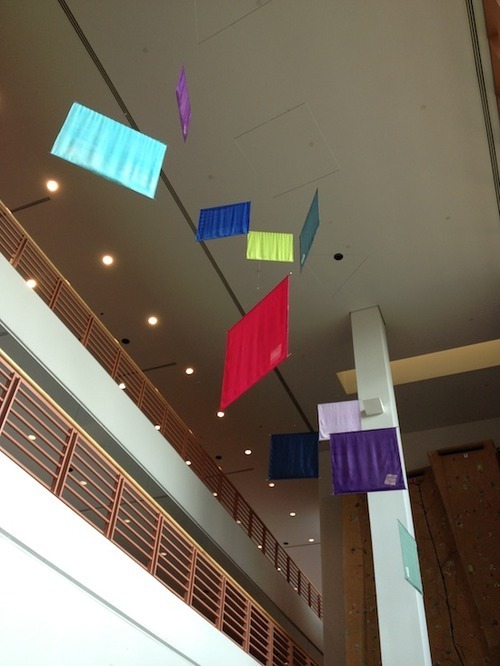 As my intention was to create a feeling of movement - ascending - through the color choice and movement of the individual pieces, the fact that it is installed next to a climbing wall also seems very appropriate. I love the idea of the climbers looking back over their shoulders and seeing this colorful mass moving behind them! The installation process was a work of art in itself. I had a whole hallway to work in, and I laid the silk on the floor in the configuration in which it was going to hang. 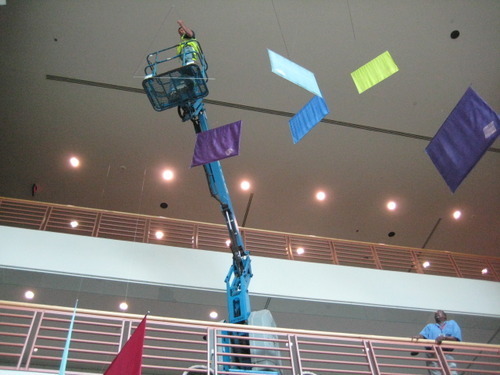 The space has 47’ high ceilings, so a Genie Boom-Lift bucket was used to hang the work from the ceiling. The boom-lift had amazing articulation, and could go anywhere it needed to - sideways,forwards, backwards, up or down. The silks were tied to 3 armatures, and each armature needed to be hung on to the ceiling separately. They were clipped onto a hook and bearing that had already been installed. It was very rewarding for me, to stand there, and to watch the colors come alive as if they were dancing. I didn’t expect this, but the stretched silk softly ripples on each of the units when the air currents change, making an even more lively display. Many thanks to the “team” who helped make this happen, especially to Benny at the Instrument Shop for creating the metal armatures, rods, and bearings for the silks to spin on, and to Jeremy for being a professional at using the bucket lift for the installation, and for understanding the concept of the design. Thanks to Keith for seeing the project happen, and of course - many thanks to Jane Russell for the inspiration! Here are some members of the team at the time of completion - don’t we all look happy to have it done? All-in-all it was an amazing experience and I hope to do many more such commissions in the future!